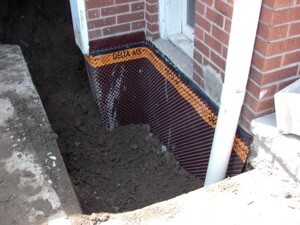 A permanent solution to a damp free basement. We cover all work related areas with plywood and tarps as required. We ensure all areas of the property and that of your neighbours' are protected. Concrete and asphalt is machine cut as required to assure a controlled seam on completion. We excavate to below the footings and clean all wall and footing areas. We open any cracks and install below grade compound. We install a chemical bonding wash on all areas. We cement coat complete areas and add chemical bonding to same cement. We tar coat and install Delta rigid membrane from base of walls to grade. We install washed gravel and a new weeping drainage system and connect to the main drains as per code. We cover the weeping drainage system with washed gravel and machine tamp all backfill to grade. We remove all debris from the site and restore areas as before. We take great pride in our clean up. Our finished job carries a 10 Year Guaranty. We offer 24 hour emergency drain service. We camera main drain systems. 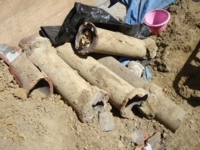 We use only fully licensed drain specialists.